This clean-lined transitional casual dining takes its roots from the art deco era of the 1930’s. The Avalon dining collection is both straight forward and dramatic. 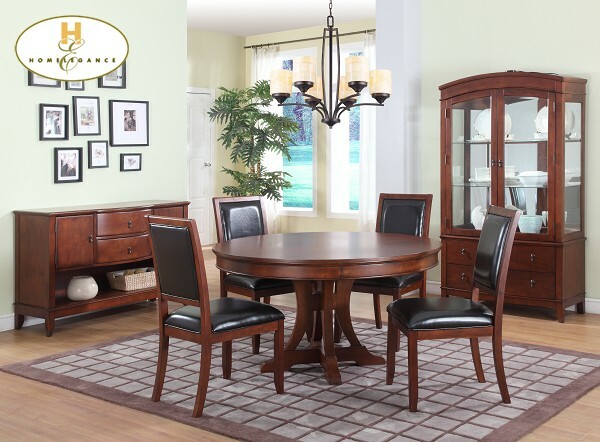 Excitement comes from its simple yet elegant rectangular leg table and two round table options, streamlined bowed fronts bunching china with tear drop drawer pulls and its matched veneer drawer front design. The dark brown bi-cast vinyl chair with style and durability makes a statement of its own. Constructed of maple veneers with select hardwoods in a contemporary low sheen cherry finish.